Hunter Beef is very common in Pakistan. People like to eat it especially in cold weather. You can store hunter beef in freezer for long time. 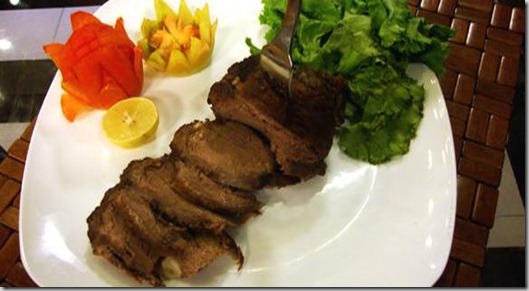 In the following recipe chef Gulzar baked the hunter beef, you can also fry it. With the help of a sharp knife poke holes into the beef. Insert a garlic clove into each hole. In a mixing bowl mix together the white vinegar, salt, black pepper and lemon juice. Spread the mixture onto the beef, cover with a plastic bag and leave for marination over night. Steam in a steamer for 30-35 minutes.Then Bake in an oven for 10-15 minutes.